Walk In Wet Room Shower Enclosure Cubicle Screen Panel 8mm Easy Clean Glass. Traditional 200mm Exposed Bath Bar Mixer Shower Thermostatic Valve Bathroom Set. Walk in & Wet Room. Luxury Frameless Offset Quadrant Shower Enclosures Designer 8mm Easy Clean Glass. Basin & Bath Tap Sets. Chrome & White Traditional Towel Rails with Valves - Size Options. These traditional style white and chrome towel rails will add an instant classic look to any room. With their high quality chrome plating, a durable powder-coat finish and being constructed using modern technology these towel rails offer style, durability and a superior level of quality than any other on the market. Included with both sizes are the radiator valves, so you have everything you need in one place! The wall brackets, blanking plug and air vent plug are included. All of our traditional towel rail radiators comes with a FREE 10 year guarantee! Small 952x405mm - 1385 BTU Output. Large 952x659mm - 2423 BTU Output. High grade quality low carbon steel construction. Safety tested at 4 bar of pressure. White 4 or 8 column radiator cast iron style construction. Tested to BS EN 442 standards. Suitable for all central heating systems. Supplied with fixtures and fittings. Comes complete with FREE traditional angled valves. This listing offers a choice of two sizes: Option 1 - Small. Surround Tube Size 32 mm. Did you know all of our radiators undergo a triple layering process? To ensure we offer the highest quality radiators on the market all of our radiators undergo a triple layering process. Did you know we double test all of our radiators? Our radiators are tested twice during the manufacturing process. Our radiators are air pressure tested before they are chrome plated, and water pressure tested before they are packaged. As a result of this there many be some water still inside your radiator when you receive it. Did you know we offer a 10 Year Guarantee all of our products? Because we go the extra mile and don't take short cuts in the manufacturing process we are happy to offer a 10 year functionality guarantee. 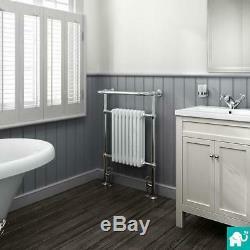 Traditional Victorian Heated Chrome Towel Rail Radiator. 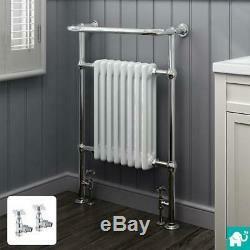 Traditional Column Chrome & White Heated Towel Rail Radiators with Angled Valves. 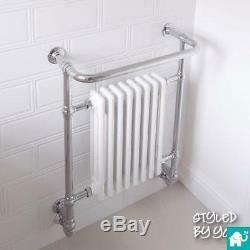 Traditional Towel Rail Radiator With Valves in White & Chrome - 935 x 475mm. Giving you diverse bathroom ranges for less We strive for excellence in all areas of our products as well as taking pride in integrating stylish yet durable bathroom fittings into each range. From sourcing and designing new items, to ensuring all our customers receive excellent advise throughout their journey with us, as well as an industry leading aftercare service or 200,000 sq. We started trading in 2006 and have seen a great increase in sales and feedback from that point to now and will be trading for many years to come. With over 300,000 feedback you can rest assured you will be receiving the service and products you deserve from a leading bathroom company. Where on my property will you deliver to? Will I have to be home all day? Items must be signed for. This means someone must be available between the hours of 8am and 9pm. A card will be left with instructions on how to retrieve your order. How do I pay by Cheque or Postal Order? How do I pay via Credit/Debit Card? We can also accept all major Credit/Debit cards except American Express payments over the telephone by calling 02476 389051. Townsend Drive, Attleborough Fields Industrial Estate, Nuneaton, CV11 6RU. I dont want to keep my item but its not faulty help! This would also depend if we have stock in to send out to you. For guarantee reasons, we would need you to send photos of the faulty item with photos of the fault itself. Once this information has been received, we can assess the case and whether a part or replacement is needed. If the item is deemed as faulty, we will arrange a collection at our expense not yours! Bath Filler and Basin Set. Bath Mixer Tap & Shower. Freestanding H & C Bath Taps. Fstanding Bath MTap Shr & Legs. Fstanding Bath Mixer Tap & Shr. Fstanding Wfall Bath Tap & Shr. Hot and Cold Basin Taps. Hot and Cold Bath Taps. Back to Wall with Toilet. Bath Front/End Panel - Wood. Cbined Flr Stnding Vanity Unit. Counter Top Vanity Unit - FS. Counter Top Vanity Unit - WH. Floor Standing Vanity & Mirror. CC Toilet w/ Basin & Ped. CC Toilet w/ WH Basin. Company; 8013835, Registered VAT number; 163586191. 22-24 Boulevard Royal L-2449, Luxembourg. The item "Traditional Chrome & White Bathroom Heated Towel Rail Radiators Size Options" is in sale since Thursday, April 16, 2015. This item is in the category "Home, Furniture & DIY\Bath\Towel Rails". The seller is "soakoutlet" and is located in GB.